You can wear it with the ribbon woven through the whole thing, or (how I’m wearing it now) with the ribbon woven through just the eyelets between front &/or back straps and cinched up a bit. Calling this a 1-ball pattern seems a little cheaty. Technically, it does use just 1 hank of yarn, but they’re big hanks. But, I don’t control the put-up size, so there. 1 ball it is! Inca Cotton is a thick/think super-soft, baby-yummy cotton, but a little sheddy to knit, so don’t wear black, or it will look like you rubbed yourself all over with a cotton ball. Women’s M, with a lot of wiggle room. Will fit a 34 – 40″ bust, measured at widest part. I was going to try it on with progressively more wildly padded bras to see just how far it would go, but I can’t find it. It’s either in a hamper, or was crammed away somewhere stupid in my last mad dash-and-stash cleaning frenzy. CO 100. Join & PM, being careful not to twist stitches. Eyelet top edge: *K2tog, YO, repeat to end. Place dart markers: K40, PM, K10, PM, K40, PM, K8 (not quite finishing row). Starting 2 st before row marker, ssk, SM, K2tog, the continue in stockinette, repeating ssk/K2tog decreases around each marker. You’ll work all your increases & decreases in the same way, starting before that first marker (since the rnd marker is also your 1st dart marker). Work 2 rnds in seed & BO. With WS facing, working from one of the front strap markers, PU 4 st around each marker thusly: 1 into the stitch on the left of the eyelet, one into the eyelet hole itself, 1 into the stitch above the eyelet, and one into the stitch on the right of the eyelet. Work 48 rows in garter, slipping the first stitch of every row. BO. Repeat for other side, being sure you’re starting on the front & not the back marker. Sew each strap into place over the marked position on the back. Starting at the start of the row, which will be comparatively untidy, weave the ribbon back and forth between the eyelets so that imperfect spot will be obscured by ribbon (i.e., the ribbon should go over that part, not under it). Tie in a bow to suit. Place marker. You put a stitch marker there to flag you to future decreases & increases. Hi! I would really enjoy making this but I know that this size is to small. My bust is more of a 40ish. Would it be possible for a larger size? Sure, I’ll math out some bigger sizes this weekend. I really like the tank, but I have one question. Can you just knit and leave the eyelet row off? Of course, although it’s nice, because they allow you to adjust the fit a bit more. But I just realized a way that looks so much cuter than how it’s shown. It still uses the eyelets, but really only needs them between the straps. I’ll take a picture and put it up tomorrow. Love the tank. Can you post the gauge for how many rows per 4 inches? And also what is the finish size, wide and length? Thanks. Oh I look forward to the more mathy version for 40″ bust! I CO the 100 sts and took a look and realized even a shoe horn wouldn’t get me into it! Thank you for posting it! Great tank! What size bust does your pattern fit? I think I’m a little larger than it is. I don’t mind figuring it out, but I need a starting point. So far I haven’t been good at estimating stretch. :^) Thanks! I love this tank. I wear this one with pride. Thank you so much for the pattern. Thanks so much for this pattern. I wore it and got lots of compliments. Your pattern was very easy to follow and adjust. What a cute top!! I can’t wait to email my daughter with this one. Inca is one of my favorite yarns. Also a fav is Rowan Allseasons and Rowan Calmer. This top would look great in those yards also. FYI – Inca machine washes and machine dries beautifully. WHAT?!?!?!?!? you may ask? I discovered this when my daughter was pregnant with her now 5-yr. old son. She fell in love with the yarn but I am never too keen on making anything for a baby that isn’t washable, and what new mother has time to block and dry flat? So I knit up a swatch and washed/dried it a few times. Shrinkage was minimal, although if anyone gives this a try, I would suggest figuring it out before you do a project to make sure you make it big enough. Is there any other kind of yarn we could use.I don’t thinkl I can get this in Canada?.I love it is so pretty. Any worsted cotton would work, but the hand and texture would be different depending on what you used. Blue Sky Alpacas Organic Cotton is smooth instead of thick and thin, but as far as the hand (wuzzy ungassed drapiness), it’s the closest. Bernat cottontots also has that same matte, soft-twist feel (versus kitchen cottons, which are smoother, less pillowy and more twine-like, and more plies). Is “tfbl” the same thing as “tbl,” through the back loop? Or do you mean through the front, then back? SO pretty! It may even inspire me to pick up my needles again. I’m a newbie. Which cast on do you recommend for this project? I typcially use a single cast on, but one of my books says its not good for garments. Thanks! Use whatever you like. It doesn’t really have any special requirements, so anything you’re comfy with should be fine, as long as you’re not too tight. Do you happen to have the math worked out for a smaller size? I have a pretty small bust size–32 on a good day. I’m afraid this will be too loose. what does ssk, SM mean? Slip, slip, Knit? PM = place marker, but can’t figure out SM. would love to make this, so plz help. I tried making this once before and it came out WAY too small in the bust area. Have you posted a bigger size yet? and proceed as directed and decreasing the row count by 1 in each section that suggests more than 3 rows. You’ll may need to adjust strap placement, but that should be straightforward. Thanks for the smaller size adjustment! I’m about a 32 – with a padded bra… :) And for suggesting the Cottontots… that’s what I was planning on since I have some stashed! Great pattern! Did you ever work out a larger size? I have made a few of these tiny ones for friends but I would really like to know how to work some larger ones, PLEASE POST!!!! 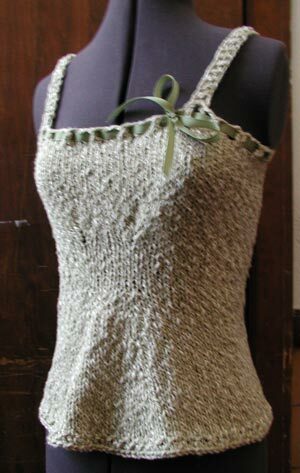 This is a lovely halter top… tempted to knit one up using the yarn used on the sample pictures (Inca cotton). From what I see, it is fitted around the waist, right? I am shor twaisted and only five feet two inches….. need tops that skim my figure, or I look boxy and sumpy. Beautiful! I love the length. Thanks.